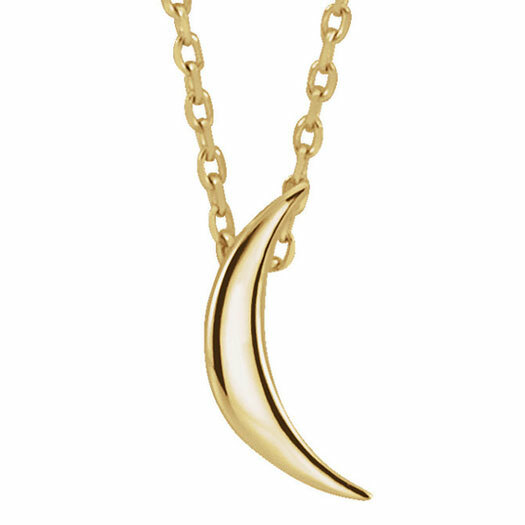 This beautiful crescent moon necklace in 14K gold from Apples of Gold Jewelry is the perfect accent to any outfit, whether it's for a casual day at work or a special occasion! The bright 14K gold of the moon shines throughout the day and night. The moon measures 7/16" tall by 3/16" wide, and has an adjustable 1mm cable chain attached. The chain has a spring-ring closure and is adjustable between 16" and 18" in length, so you can choose where you would like the pendant to sit. 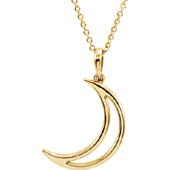 We guarantee our Crescent Moon Necklace, 14K Gold to be high quality, authentic jewelry, as described above.